Eric Gaucher, the director of the biology department at Georgia State, and Jessica M. Parilla, the undergraduate director of the biology department, hope to create a culture where students strive to use technology for academically honest reasons. “I think we have seen an increase in the number of students who use digital platforms for academic dishonesty purposes. I think each one of those platforms is used differently, and I think each one of these platforms have completely legitimate purposes,” Parilla said. Some of these digital platforms include GroupMe, Quizlet and Chegg. Parilla said that she thinks there are plenty of students who are using them “the right way,” but because students across the board are using them more often, the number of students who are using them inappropriately is growing as well. Quizlet actually has a long-standing policy prohibiting the posting and sharing of test banks and other cheating content. Their community guidelines specifically prohibit this behavior and their honor code details their approach to supporting academic integrity on Quizlet. “The misuse of our platform to develop bad habits, such as cheating or cutting corners on assignments, is disappointing to us and we encourage any student or teacher who finds content on Quizlet that may violate our honor code to reach out to us through our dedicated portal for these requests,” Laura Oppenheimer, director of marketing at Quizlet, said. Quizlet’s community guidelines state that any student or educator who believes material on Quizlet is negatively affecting their course or curriculum should contact them so they can address the issue. “We have internal tools in place to identify and remove this material and are continually working on increasing our capacity to combat this issue proactively on a technical level,” Oppenheimer said. 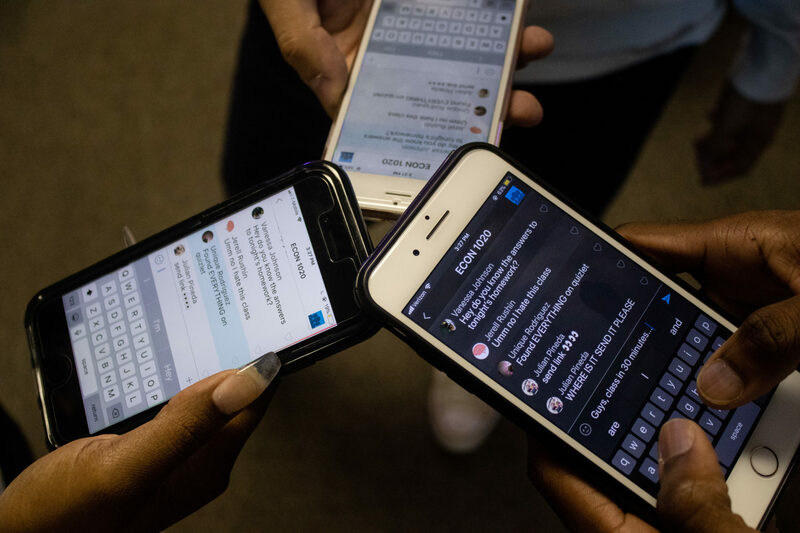 Parilla said that GroupMe has been its own special situation because students usually start with the best of intentions, but then one or two students begin using the platform as a means to cheat. “If we could just redirect the energy that students are putting into cheating and take that energy and spin it into actual studying, we’d be set,” Gaucher said. In the biology department, a group of students saw something they should not have seen in a GroupMe chat, and one person reported it. The witnesses were let off with a warning because it was discovered that students truly did not know the policy. “Because they don’t say anything about it, they are also violating the academic honesty policy because they have this stuff available to them, whether or not they use it, and they’re not reporting it,” Parilla said. “In the college committee, one of the most often defenses that we get when students are brought to the petitions hearings is ‘I didn’t know I was doing anything wrong. I didn’t know that this was plagiarism,’” Parilla said. As a result, dozens of students are accomplices without really being aware of what’s happening. “We have to do a better job of getting students informed of the policy because there are some very important things that are going to change the way students view cheating at Georgia State,” Gaucher said. At academic petition hearings, an instructor only has to prove that it was more likely than not that the student was cheating, and the digital age we are in is making this a lot easier to do. “The burden of proof becomes a lot easier to establish because with digital platforms, everything is being recorded, there’s a digital record of everything that has everybody’s names on it,” Parilla said. And as it turns out, students are very unaware of this. “There’s a culture that exists where cheating is almost part of the game. There’s a cat and mouse game that takes place that is a lot more prevalent on this campus than other campuses. Nobody values the snitch,” Gaucher said. However, finding a way to capture every single student and make sure they know the policy remains difficult. “Our goal is not [to] punish students for this right off the bat. The goal is to get everybody aware of this so that once everybody is aware then we can start holding people accountable more severely,” Gaucher said. They both hope that this effort can shift student focus from abusing online platforms to actually utilizing the resources available to them at Georgia State. “A lot of times the answers that they give on Chegg, the expert help, is wrong. It’s terrible. I don’t know who they’re hiring but they are not experts. If they had just contacted somebody in the tutoring center or their teaching assistant or someone who actually knows how to help them, they would get such better help,” Parilla said. There have been reports of professors going as far as banning the use of GroupMe entirely with the intention of closing all avenues to cheating. But, Gaucher and Parilla don’t see this as the right solution. “You don’t ban the technology when the technology can be used to enhance student learning. You put your effort and energy into changing the culture so that people have the right mentality to utilize that technology,” Gaucher said. Parilla said in the long run, cheating hurts students more than it helps them. “You get out in the field, and then what happens? You are completely unprepared for your career. It’s such a short-term strategy that ends up hurting them in the long run as well because they never actually prepare for this career path,” she said. Even though students may know this, a lot of them share the ideology that they are all in this together. “There’s an odd culture that exists here. Maybe people are a lot less individually competitive at Georgia State then they are at other places and they are more as a community,” Gaucher said. Gaucher and Parilla both said that raising awareness is only the start and is no way at all the solution to this issue. “We’re not trying to come down on students and … we’re just gonna nail everybody to the wall. We’re really committed to seeing our students succeed,” Parilla said.